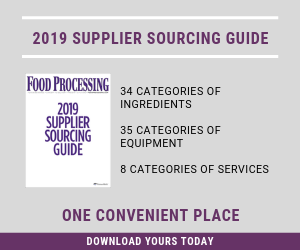 Our editors selected the following ingredients to feature in our January 2019 issue of Food Processing. See which products they chose. Brenntag created a global Food & Nutrition business unit. It draws together the company’s food and beverage specific capabilities in 73 countries, with over 750 dedicated employees and 28 food application and development centers. Technical teams will create tailor-made food and nutrition formulations and solutions, supported by dedicated marketing and sales people. Vice President Tom Corcoran leads the Food & Nutrition Brenntag Group. See www.brenntag.com/food-nutrition.